I thought I would illustrate some of my adventures. One thing I’ve never lost as I’ve grown older is my appetite for adventure. Growing up I spent much of my summers at Lake Tahoe, Twain Harte (just east of Sonora, California), Yosemite and our cabin in Cedar Ridge (just east of Twain Harte). Twain Harte and Cedar Ridge were in the heart of the ‘Mother Lode’ gold rush country of California. There was always a old abandoned mine to explore, an old 49er’s cabin (that’s a miner not football player) to discover or an old ore crusher to climb. The Stanislaus River was a three-hour hike from our cabin, past the old Hazeldell mine*, down a long winding trail through a rough and untamed Sierra. (Or so it seemed at nine years old). My Grandfather, Everett Prusso, was a great story teller. He would gather all the grandkids around him at his home in Twain Harte and tell tales of growing up in old California, Tahoe, exploring the back county of Yosemite, the 1906 San Francisco earthquake and scary ghost stories. During these years, my sense of adventure and imagination burgeoned. When I was eleven or twelve I went with my family on a camping trip to the South Fork of the Yuba River in northern California. Having just read Tom Sawyer, I decided to build a raft and float down the river. I had visions of great adventures, encountering Indians, 49ers, and wild beasts… I spent most of a day collecting drift-wood logs, an old piece of plywood, rusty nails and rope. By late afternoon I had a first class raft, complete with folding lawn chair and styrofoam cooler full of iced-cold Shasta root beer. 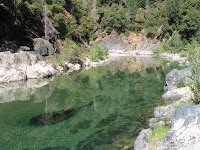 The Yuba River is nothing like Tom Sawyer’s mighty Mississippi. Instead of a broad, slow moving waterway where you could drift for days, weeks or even months; the Yuba is narrow, fast and full of rapids, rocks and waterfalls. After only a short distance, my raft plummeted over a cascade, crashed into a rock and broke apart. I managed to save myself and the root beer at the precipice of the falls. The chair, I’m sure, is still at the bottom of the river! Disappointed with my adventure, I trudged back up the river, my cooler trailing behind me and started planning my next venture. By the time I was thirteen I had become a Greyhound bus aficionado. I would bid my mother good-bye in the morning, then take the number 81A bus to downtown San Leandro, California, jump on the Greyhound to go to Los Angeles or Twain Harte or where ever my heart fancied. When I was sixteen, I read in National Geographic the story of Robin Lee Graham, the fifteen year old who sails around the world in a twenty-four foot sail boat. My life and my imagination changed. Suddenly, if Robin Graham could do it, so could I. The day after I graduated from high school, at age seventeen, I traided Greyhound Bus for Western Airlines and flew to Hawaii. All that I owned fit in a backpack. I picked pineapples by night so I could swim, snorkel, sunbathe by day, and whenever time permitted, sail between Lanai and Maui, explore Lahaina and then sail back to Lanai. After Hawaii my adventures changed. I returned California and got a job with Ma Bell. I didn’t like working 9-5, but I did like the money. I bought a brand new, right off the showroom floor, 1971, Shantung Yellow, VW Super Beetle! Now my adventures took me in a whole new direction. I was mobile and I was free. Unfortunately, my new beetle did not float. So, I left the ocean behind me and returned to the mountains. I hiked parts of the John Muir Trail and the Pacific Crest Trail in California, then parts of the Pacific Crest Trail in Oregon. 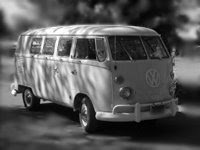 In 1973 I traded my bug for a bus. A 1966 VW Kombi-van to be precise, appropriately named, Goofy. I had removed the back two rows of seats and replace them with a double bed, an icebox and a Colman stove, and then moved to Idaho, where new adventures waited. Yellowstone and Teton National Parks were at my back door. I did a stint working for the National Audubon Society counting birds, moose, elk and deer along the Warm River, just west of Yellowstone. The next adventure took me literally half way around the world and to the southern hemisphere. Australia. I spent two years in the land down under. If you haven’t watched the sun set below the Indian Ocean, then watch the Southern Cross stream across a moonless black sky, you’ve missed a lot. Australia is an incredible immense continent. For twelve years I had been traveling. Buses, planes, trains and VW. Now it was time to take traveling to the next level. Get paid to travel. Once again I packed all my earthly belongings in a backpack and moved to Hawaii. This time, however, it was to go to school. I move to a little house on Laie Bay, Oahu. 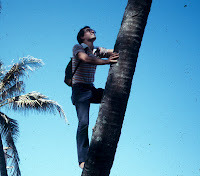 I worked at the Polynesian Cultural Center and studied at the beach. Hawaii is a magical place for an adventurer. It would take me too long to tell of all my adventures so I am going to tell on only one. (At least in this posting). On the north side of Kauai is a twelve mile trail called Kalalau. Prior to 1979, Kalalau was like walking back into prehistoric time. You started the trail on a path that climbs three hundred feet above the crystal clear waters of the Pacific. The path is paved with large flat volcanic rock that was laid down, as legend tells, a thousand years ago by the native Hawaiians. Once you reach the pinnacle, the path turns northward and all traces of civilization fade behind you. The trail continues two miles along a sheer cliff face, sometime raising six or seven hundred feet above the ocean. Pandanis trees and century plants line the path. At the two mile point the trail turns into the Hanakapi’ai Valley and back down a beautiful white sand beach. From the beach you could take the trail in land about four miles through the once terraced taro patches to the spectacular, four hundred-foot Hanakapi’ai falls or, continue another four miles along the coast to the Valley of Hanakoa. Hanakoa, an old coffee plantation, is cool and humid. Guava trees are everywhere and it smells like a fruit salad. After several years in Hawaii the mountains called me back. But this time it was the Rocky Mountains of Utah that played the siren’s song. I started a new career in the travel business. Now I was free to travel at will and for a fraction of the cost. During my thirty-five years in the travel industry, I’ve traveled to Australia, New Zealand, Guam, Saipan, Hawaii more times than I can count, Belize, Mexico, St. John’s, St. Thomas, England, Ireland, Scotland, Belgium, France, Germany, Switzerland, Russia and Italy. I’ve dived below the sea with scuba gear, snorkels, and in submarines. I’ve flown over the North Pole , hovered over an active volcano and soared high above the north shore of Oahu. So I decided, a few years back, to take some of my adventures and love for the tropics and sailing and build a story around them. I picked the adventure of 238 Mormon pioneers living in New York who are asked by Brigham Young to sail 26,000 miles to San Francisco. This story is often lost against the more dynamic tale of 20,000+ refugees that make their way across the plains, but, never-the-less their story is no less valiant. The four main characters are very, very, very, very (almost imperceptibly) based on my son Thomas, and his three middle school friends, Matt, Nicole and Elizabeth (known to the world as, Betsy) I placed the fabilistic foursome in the middle of this epic story of courage and bravery aboard the “good ship” Brooklyn. Many of their adventures, sitting behind waterfalls, building rafts, eating sweet Mountain Apples, climbing coconut trees….. are pulled from my past. I hope you enjoy this adventure as much I have writing, and in many cases, living it. *About twenty years ago a developer dynamited the Hazeldell, turned the trail in to a paved road and built cabins along the hill side. Sometimes you just have to hate progress. For more information on the Hazeldell mine, you’ll have to read my next book, Scrimshaw’s Revenge. **Years later I went back. My brother and I hiked the twelve grueling, humid, narrow, steep, sheer, muddy miles to Kalalau Beach only to find Zodiac boats disgorging fat white tourists who played volleyball on the beach and drank diet Pepsi while eating Doritos and seven- layer bean dip. It was disgusting. Purchase an autographed copy of Ghost Waves, by W. Everett Prusso. Click here.